For years now I’ve been doing some kind of volunteer work for the environment. I began by doing office work for the Nature Conservancy in the 1990s, but that was too much like my day job. Since then I’ve collected seeds, planted shrubs and grasses, and revegetated roads and trails for several organizations. In the past few years I have enjoyed urban gardening the most. 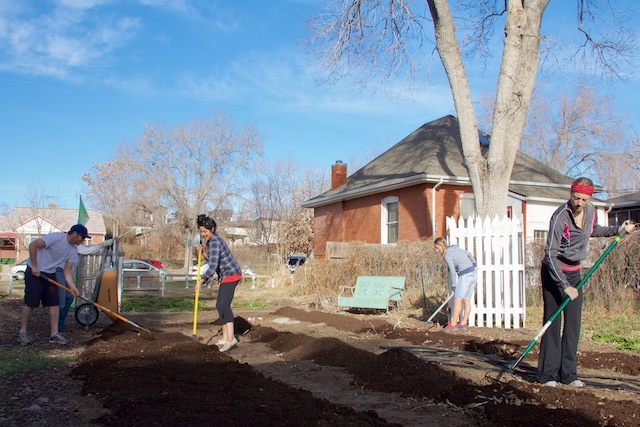 Last Sunday I and about 15 other people woke up the beds and planted cool-season crops at Sunnyside Garden, one of UrbiCulture Community Farms’ locations throughout Denver. 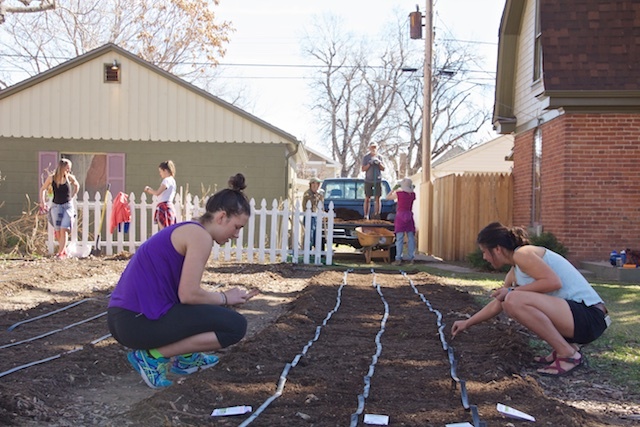 We began by spreading compost on 4 long rows; 4 newer, short rows; and a small spiral garden. Behind the spiral garden below, where arugula has sprouted, is the house where the owners of this property live. The compost was raked out to lightly cover the beds, about 4 feet wide, which creates space for several planting rows but is narrow enough that you can reach into the middle from the walkways. I helped turn the compost into the soil, and then the bed was raked again and planted. 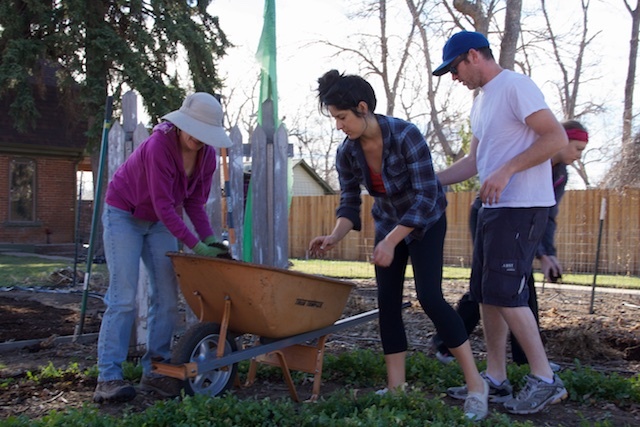 We were careful to do our work from the walkways, not stepping on the beds to keep from compressing the soil. This site is small, and at times the volunteers raking and digging followed each other in quick succession. When there wasn’t any more soil to be turned, I took pictures, and later in the morning I laid out a few drip lines, which in the picture above have been moved onto the walkways. 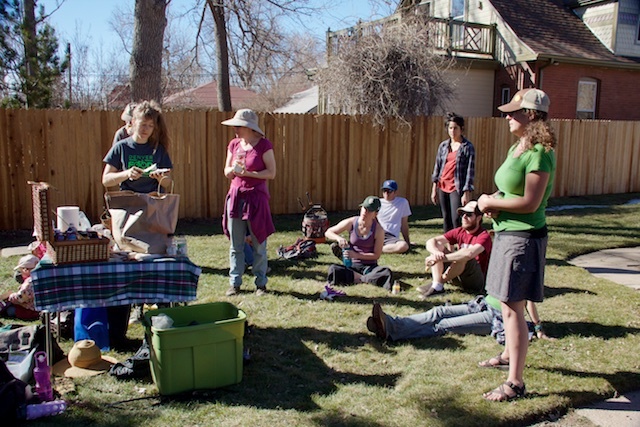 Mid-morning, Candice Orlando, the executive director of Urbiculture (in the green shirt on the right), gathered everyone around the food table and answered questions about getting a spring garden ready. The drinks were provided by the owners of the property. 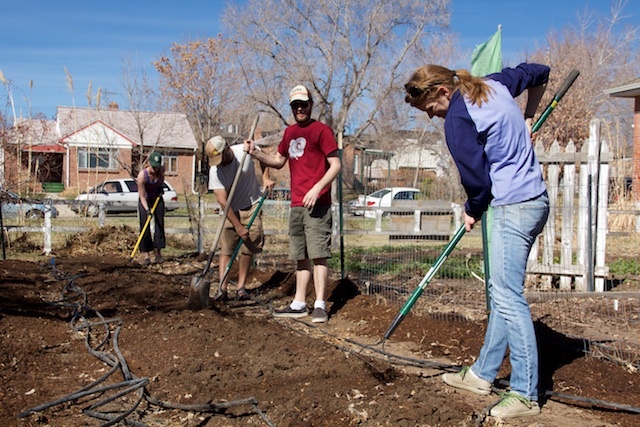 UrbiCulture is “a multi-plot farm committed to providing food to people of all income levels by sustainably growing affordable, local food in the Denver metro area. We engage our community by educating our youth and neighbors on growing food and promoting healthy, active lifestyles, beautifying our neighborhoods with edible landscapes, and lessening the distance from farm to plate.” Later in the growing season, UrbiCulture will open their donation-only farm stands, where shoppers pay what they can for produce. Sometimes I fantasize about having my own urban micro-farm. (How I would be able to farm from March through at least October and travel around the world is a question for another post.) Although I agree with Urbiculture that gardens are preferable to lawns, I think the logistics of finding space would be time-consuming. So if I do ever set up a farm in the city, I think it would have to be my own property or property I lease from someone else. What a beautiful activity, nothing like sharing these moments with good people outdoors.